Aarthi is the heartbeat of our society as it takes place every week. It is a popular ceremony celebrated in the Hindu faith. This blissful practice is often associated with light and love. We light candles before the sacred images and chant prayers that help strengthen our faith. Diwali is also celebrated within the society to provide a home away from home for our students. It is an important festival for all celebrating as it brings purity and prosperity in our lives. It is known as the ‘festival of lights’. As well as an event of our own, we attend The Hull and East Riding Hindu Association Diwali festival as they put together an incredible display for art, culture, food and fireworks! 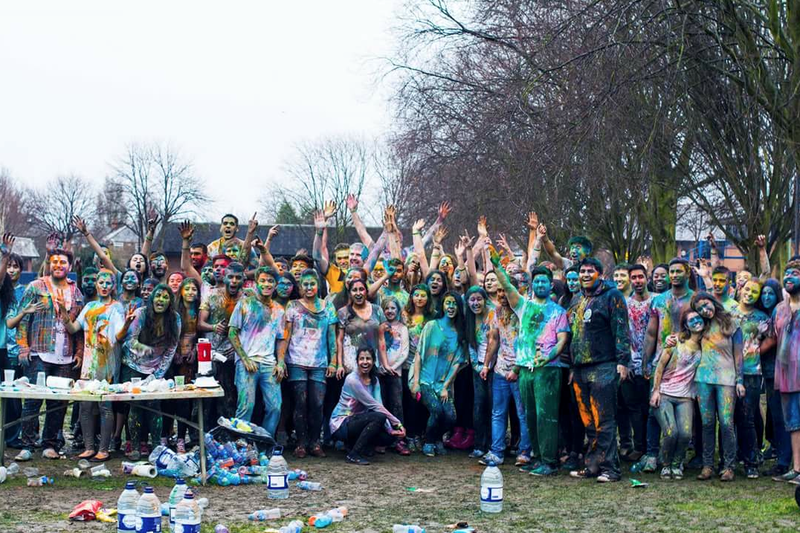 Holi is a major flagship event, known as the festival of colours! We all chase and colour each other with powder, and end up having a water fight. It is one fun festival where everybody gets together to celebrate the start of spring. Although we are a religious society, we encourage and welcome people of all faiths and backgrounds. We host a number of other events throughout the year including meal outs, Big Fun, Bowling, Bollywood nights, Garba and many homely based events to encourage togetherness and friendship. And join the Facebook page NHSF Hull Hindu Society for further details on upcoming events!